This is a list of what I believe to be correct Pontiac engine colors by year. More information to be added as it becomes available. Thank you for contributing!! * These need to be researched more and are not guaranteed to be accurate. Paint charts are listed at autocolorlibrary.com. Many of the charts also list engine paint. Be aware that these may or may not be correct. The colors shown are for reference only and there is no way to accurately display these colors on different computer monitors. Available at most local parts stores. Aluminum engines are generally unpainted. Duplicolor General Motors Blue DE 1608. Users report this is a good match to GM's original color. Plasti-Kote GM Corporate Blue 221. Users report this color does not match. Note that aftermarket GM blue usually varies from original GM blue. This has been confirmed by owners of original GM paint. It has been speculated that Pontiac L78 and W72 engines were painted a different blue, but checking these engines against genuine GM engine paint samples indicates GM corporate blue is correct. PPG/ Ditzler Blue Poly 14817* for Pontiac engine paint. PPG/ Ditzler Blue Poly 2083* for Oldsmobile engine paint. *Not known why the two above are listed as different paints. Bill Hirsch Auto Oldsmobile Metallic Blue 1966-On 455 CI' is reported to be a good match. At least one original looking February 1975 example has been found where the engine paint is a lighter non-metallic blue. 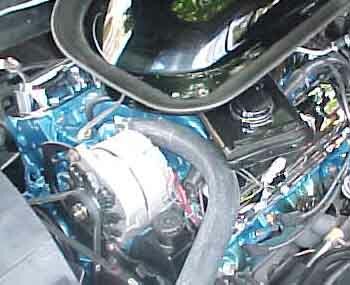 If anyone has any information on an alternate 1975 Pontiac engine color, please contact me. Pontiac V8 Dark Blue Used for all mid-73 thru 74 Pontiac engines including the 73-74 SD-455. Contrary to rumors and some magazine articles, the SD-455 did not have a unique color. SD-455 engines were not released to production until April 1973. Any SD-455 engines built before March 15th would have been repainted in this darker blue (see below). Classic Industries Slate Blue 62220 is supposed to be very close. Vendors that provide an incorrect color for 73-74 are not listed. Light Blue No Picture Per factory service bulletin number 73-T-21A: "Engines built after March 15, 1973 starting with engine number 532727 had a revised emissions system (two thermal valves near the front of the intake manifold and no EGR solenoid) and were painted this color. In addition about 700 engines before this number were retrofitted and repainted." Engines that were already assembled when repainted will show signs of the lighter blue in certain area and touched up black brackets to cover up over-spray. Some engines after # 532727 appear to have also been repainted according to one owner. If any SD-455 engines were manufactured before April 1973 they were most likely painted the color below and then repainted the above color when emissions equipment was revised. 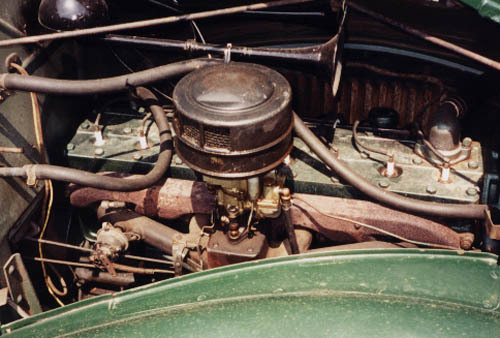 One early SD-455 example indicates that the engine was partially repainted the darker blue while in the car. However, factory documentation indicates production SD-455 engines were built after the emissions change. Performance Years RPE481 Listed as 73-74. Not sure what color it actually is. Bill Hirsch Auto lists incorrect color for these years! Click Here for the mix formula from a GTOAA article. The batch of SD-455 engines manufactured in Jan-Feb 1973 were most likely painted this color and then repainted the above color when emissions equipment was revised. 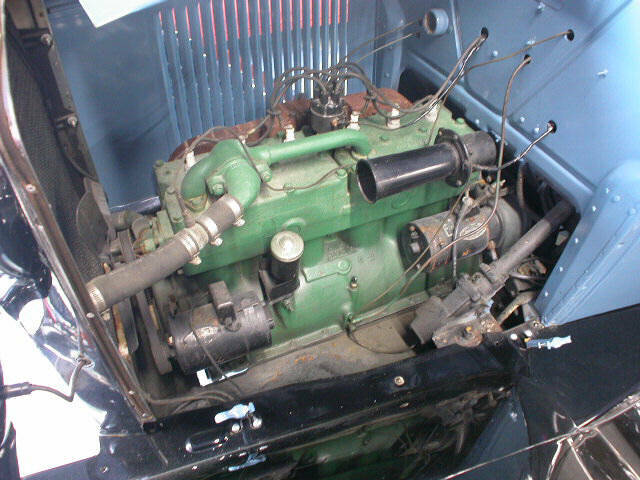 One early example indicates that the engine was partially repainted the darker blue while in the car. Pontiac 6 & V8 Light Blue Metallic This color is well documented and listed in Pontiac master parts catalogs. Bill Hirsch Auto Reported to be high quality paint. Hirsch lists this is being used through 1972 which is incorrect! POR-15 Pontiac Metallic Blue They recommend a silver base coat first. Paint is reportedly difficult to apply, takes a long time to dry and does not look exactly like the factory color.  This color is no longer listed on their website. Pontiac V8 Light Blue This color is well documented. Pontiac V8 Turquoise Blue Bill Hirsch Auto Reported to be high quality paint. Pontiac originally purchased this paint from a company called "Pontiac Paint and Glass", which no longer exists. with Chevrolet V8* Chevy Orange Between August 23 and September 7, 1976, the Flint, Michigan Engine Assembly Plant changed the paint colors used on Chevrolet engines from orange to blue. Some early production 1977 Chevrolets were built with the orange painted engines. Pontiac V8 Dark Green Years, engines and color not yet verified. Pontiac L6 & L8* Green Years, engines and color not yet verified. Color may have changed after WWII. Pontiac L6 & L8* Aqua Green Years and engines not yet verified. Oakland Light Green Years, engines and color not yet verified. Oakland Years, engines and color not yet verified. Many thanks to Rocky Rotella, Will Baker, Ron Wagner, Jon "CarbKing" Hardgrove, Rich Miller and the gang at classicalpontiac.com, John Witzke, POCI Tech Advisor for the 1977-79 W72 Performance Package, Linda Naimoli, Robert Cirilli, Pete Chronis, Mark Ciepiela, Joe Pattan and and many others who have made the sharing of this information possible.